Many team members at POET have spent countless hours researching, developing and constructing Project LIBERTY and are becoming the first cellulosic experts in their fields. In the last three issues, Vital has started introducing the people who are the heroes of their local communities and of POET’s 27 Biorefineries. This issue will be a little different with an ethanol plant that is a little different. Working in a first-of-its kind facility, the teams behind the research, development and operations of Project LIBERTY are also the first of their kind and they’re paving the way for cellulosic ethanol. These teams have been essential from the beginning – from the very idea of Project LIBERTY. They have done everything from writing grants, patenting chemical processes and creating new baling processes. They’ve been responsible for the design and construction of first-of-its-kind equipment, forming international partnerships and collecting biomass at an unprecedented scale. These accomplishments come at a cost including working double shifts and weekends, shoveling spilled material, unclogging heat exchangers, and replacing valves. Some have spent months completing processes to realize a better way only to scrap the original process and design a better one. Today, as Project LIBERTY is starting production, the team is putting in long hours and taking on tasks above and beyond their typical positions. And this isn’t the first time team members at POET have stepped up to make cellulosic ethanol a reality. In 2008, many team members (some of the same team members working on LIBERTY today) put in the hours to see the success of the pilot scale facility at POET Research Center in Scotland, SD. Engineering Research Director Dave Carlson was involved with the pilot plant’s planning stages. In those early years, he sometimes wondered if Project LIBERTY would ever get built. But he’s seen firsthand how this team has made sure the world’s first commercial-scale cellulosic plant would become reality. Today, the Scotland facility has grown to 70 employees, many of whom work directly on the pilot plant. Carlson has recently been in Emmetsburg, Iowa working on LIBERTY’s start-up, and his typical day feels a lot like Scotland in 2008. And that humongous scale requires many man hours. 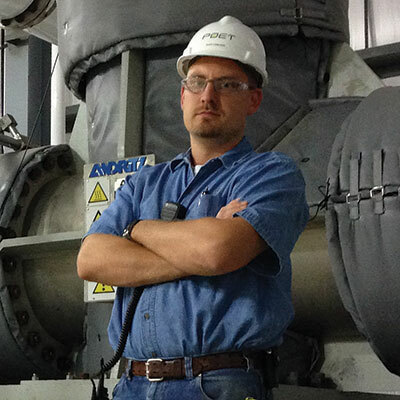 from troubleshooting a vibration in a motor to analyzing data to improving the biomass pre-treatment process. After that 7:15 p.m. meeting, Gomer heads back to his hotel room or, maybe, makes the two-hour drive home to Sioux Falls. maintenance has been uniquely involved in the opening of Project LIBERTY. 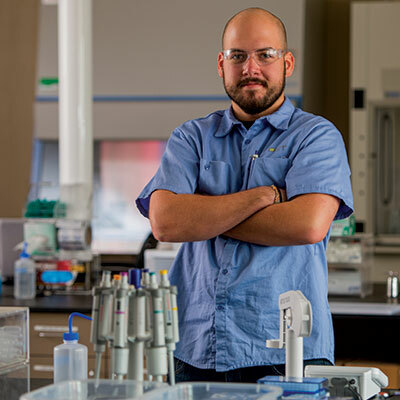 With a long-term interest in the development of cellulosic ethanol, the position as Lab Technician at Project LIBERTY seemed like a natural fit for Nick Pokorzynski. He’s been thrown right into the mix, which, for him, focuses on making sure the plant’s instruments are designed properly and working like they should. While Pokorzynski’s hands-on experience with the instrumentation has been his top priority, he says the real satisfaction has come from the team effort. 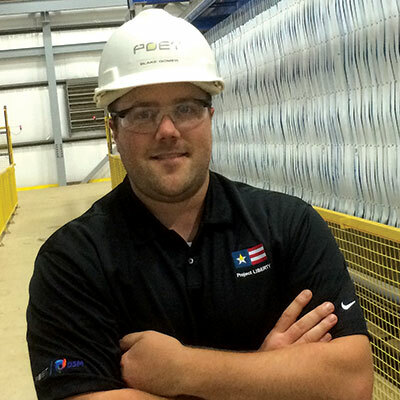 Since starting as a Plant Engineer for Project LIBERTY in January, Ted Elverson has been through everything from trainings to plant shutdowns to jumping into LIBERTY’s start-up. Having grown up on a farm, Elverson knew he wanted a job that would keep him connected to agriculture. He even chose his degree, Ag and Biosystems Engineering degree from South Dakota State, knowing it would prepare him for a career in the ethanol industry. Those steps forward have been essential. Before start-up, trainings were held, but Elverson mentions that nothing can really prepare you for the real-thing. In her nine months working as a LIBERTY Plant Engineer, Anna Cline’s team approaches the process by setting goals to accomplish the challenges that arise daily. “We always tackle the challenges as best as we can. It can make it hard to plan or predict how close to the goal we’ll get that day – but we’re always bettering the plant as we go,” Cline says. The team doesn’t have experts to turn to. As they start-up LIBERTY, they troubleshoot issues never seen before and improve processes originally thought to be ideal. And while start-up is taxing on the entire team, it’s the big picture that keeps them going. Eventually the kinks will be worked through, the processes flushed and the start-up complete. And when the dust settles, a first-in-the world process will be complete and a new set of experts born because of it.